Multiracial, married with children and loving it in Poland! 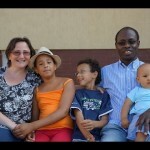 The Laseges are a multiracial couple living in Zielona Gora in Poland. Africa Web TV met up with them to hear their story. Happy viewing.